Tube of choice, you will need one that has a close up. don't know if the tubes can be found elsewhere. But do not use unless you have a license to do so. and apply Effects, Pixelate Effects Distortion Warp, name this warp. move your tube down under Ellipse. Add your copyright and name, give your name the same drop shadow as your tube. 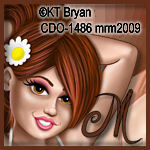 Open up the image you put to one side, crop 150 X 150 using the part of your image, you want to use.